This book provides you with the most comprehensive and authoritative overview of youth crime and youth justice available. Includes updated chapters on youth crime discourse and data, youth victimology, youth and social policy, youth justice strategies and comparative and international youth justice, providing a critical analysis of issues such as institutional abuse, child poverty, cyberbullying, child trafficking, international children's rights and transnational policy transfer. Covers numerous issues raised by the UK coalition government’s law and order and austerity policies including ages of criminal responsibility, the ‘rehabilitation revolution’, ‘troubled families’, abolition of antisocial behaviour orders (ASBOs), initiatives in gangs, gun and knife crime, responses to the August 2011 riots, prospects for restorative justice and reductions in child imprisonment. Keeps you up to date with contemporary research into explanations of youth crime, youth and media, youth cultures, youth unemployment and training programmes, and youth justice policies and takes into account recent legislative reform. Features a new companion website, featuring links to journal articles, relevant websites, blogs and government reports. Complete with chapter outlines, summary boxes, key terms, study questions, further reading lists, web-based resources and a glossary, this is the textbook to take you through your studies in youth and crime. 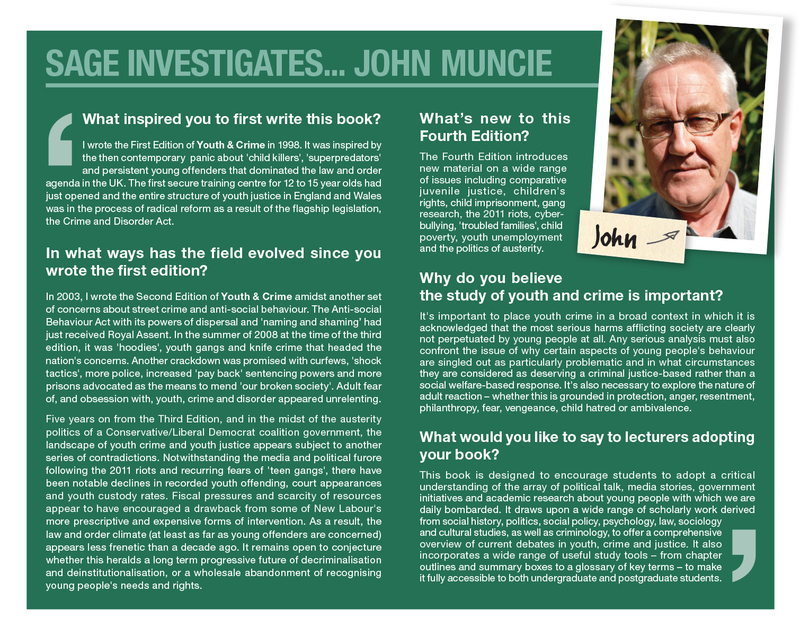 John Muncie is a leading international researcher in the related fields of youth criminology and youth justice studies and the fourth edition of Youth and Crime goes a long way towards setting the agenda. The unique balance between authoritative scholarship and accessibility makes the book a vital resource for researcher, teacher and student alike. In fact, it is almost impossible to imagine engaging with the study of young people, crime and criminalisation without reading the fourth and comprehensively updated edition of Muncie’s remarkable text. The new edition of John Muncie's Youth and Crime succeeds in the difficult job of improving an already outstanding textbook. Indeed, this hardly does it justice for Youth and Crime not only does what one would expect a first rate textbook to do – provide comprehensive, accessible and up-to-date material for students – but offers so much more. It provides a grounded theoretical and empirical account of the enormous changes that have occurred in the ways in which we understand and respond to young people using the machinery of criminal justice. As such it has no serious rivals. The module introduces students to issues surrounding youth crime and youth justice in relation to the English and Welsh youth justice system.The book provides a comprehensive up-to-date overview of the youth crime and the youth justice system, which will help stimulate students learning on the course. An excellent text that I use to support a pathway of option modules on a sports-based degree programme. This book provides excellent examples of critical analysis on issues such as institutional abuse, child poverty, cyberbullying, and child trafficking. Of significant benefit are the companion website, featuring links to journal articles, relevant websites, blogs and government reports. The book continue to remain relevant, clearly written and updated with relevant materials. Great resource, particuarly at level 5. Well written and accessible for students and staff. Inclusion of contemporary research into explanations of youth crime, youth and media, youth cultures, youth unemployment and training programmes, and youth justice policies and takes into account recent legislative reform. A brand new companion website, featuring links to journal articles, relevant websites, blogs and government reports.